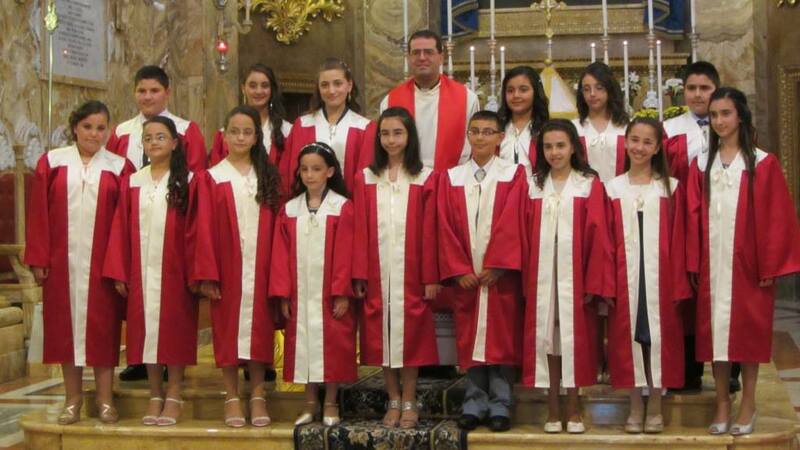 This year the sacrament of Confirmation was administered to all the candidates from the parishes of Gozo in one ceremony which was held at the Ta’ Pinu Sanctuary Square, Gharb on Friday the 17th of May 2013. There were in all 276 adolescents present to be confirmed. Our parish of Zebbug had 15 candidates. The sacrament was administered by five bishops; Mgr. Mario Grech bishop of Gozo who was the main celebrant, Mgr. Paul Cremona OP Archbishop of Malta, Emeritus Archbisop Guzeppi Mercieca, Mgr. Charles Scicluna Bishop Auxiliary for the archdiocese and the new Apostolic Nuncio Mgr. Aldo Cavalli. The celebration began at 6.00 p.m. Parishpriest Can Reuben Micallef concelebrated.